Hardcover - 176 pages - On 20 July 1969, US astronaut Neil Armstrong became the first man to walk on the moon. This is the story of the Apollo 11 mission and the 'space hardware' that made it all possible. 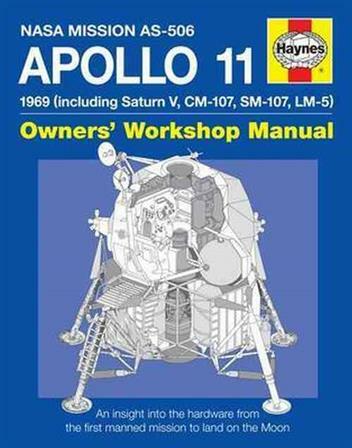 This manual looks at the evolution and design of the mighty Saturn V rocket, the Command and Service Modules, and the Lunar Module. It describes the space suits worn by the crew and their special life support systems. We learn about how the Apollo 11 mission was flown - from launch procedures to 'flying' the Saturn V and the 'LEM', and from moon walking to the earth re-entry procedure.